SALT LAKE CITY, UT, Feb 13, 2014 – When you are a recognized leader in orchestrating life-changing rafting adventures in the West, good things are bound to come your way. So is the case for Holiday River Expeditions who has been chosen by the innovative business leadership training firm NewCo to operate a series of river trips / executive boot camps on the Colorado River this year. Such strategic partnerships are nothing new to Holiday River Expeditions (https://www.bikeraft.com/) who, over their nearly five decades of existence, have operated niche trips for everyone from boy scouts and church groups to universities, corporations and nonprofits. NewCo works with business leaders, owners and entrepreneurs who recognize that the way they do business isn’t working as well as it used to. These are people who believe there is more to a successful business than profit, are motivated to learn new ways for dealing with the chaos of today’s workplaces and want to develop the habits needed to implement their visions and make sustainable changes in their organizations. NewCo’s “Leadership for the Long Term” program is a six month long, experientially based course for business leaders looking to shift the paradigm. “The curriculum is highlighted by a five day “detox” trip, which is where Holiday River Expeditions comes in. For those who can’t imagine life beyond today’s endless list of distractions, this top shelf, fully guided adventure promises to deliver the impact of knowing what’s possible when our usual screen time is filled with movement, mind clearing, focused activities and thoughtful conversations with a like-minded community – all in amazing places,” states NewCo founder Bettina Slusar. NewCo picked Holiday River Expeditions to operate the rive trip portion of their program based on a prior experience Slusar had with them. “Bettina and her family had done many trips with Holiday through The Sierra Club Outings program we help outfit. When she started NewCo she already knew we provided a quality experience on the river and felt it would be the perfect fit for her plans at NewCo,” added Johnson. NewCo’s trips with Holiday this season will be in May, June and October. Groups meet in Grand Junction, Colorado and depart shortly after to float the Colorado River from Loma to Cisco through Ruby, Horse Thief and Westwater Canyons. NewCo leaders will facilitate each day, using this four day/three night trip to get participants out of their habitual environment and into the quiet zone of pristine wilderness where innovative and transformational thinking can occur. For more information see: http://thinknewco.com/pdf/trip_snapshot_colorado.pdf. 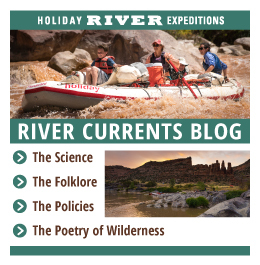 Holiday River Expeditions (https://www.bikeraft.com/) began in 1966, when Dee Holladay and his wife Sue took the plunge to become river outfitters. Due to its respect for the lands, rivers, guests and employees, the family-owned-and-operated company has grown exponentially. Each of its guides is professionally trained in first aid and river safety, and with over 47 years of experience, the company provides guests the opportunity to explore the nation’s wild lands safely and securely. Holiday River Expeditions has a philosophy to protect the environment through education and conservation, and as such, uses oar-powered and paddle rafts exclusively. For more information, availability, reservations or a copy of the 2014 catalog please call 800-624-6323, Email: [email protected] or log onto: https://www.bikeraft.com/.